If you are a Doctor Who fan that knows all the Doctors then you of course know that the 5th Doctor had a piece of celery pinned to his jacket and if you want to copy that then we found the perfect solution for you. 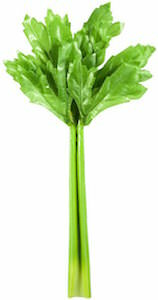 This is not a real piece of celery so you never have to worry about it going bad. The celery is hypoallergenic, lead free, cadmium free and even celery free and is about 8 inch tall and just simply pins to anything you can pin things on. Your coat, backpack or maybe even your Doctor Who t-shirt can all use this pin. And to make it even better this Doctor Who celery pin comes in a gift box. Round buttons are fun but if you are a Doctor Who fan then you will love these shaped pins even more. This set has two pins one looks like the Tardis and the other one looks like a Dalek and they have a lot of detail and they do look a bit more like the classic pieces. These buttons have a pewter like finish and that makes them only better and more special. Just imagine have one of these pins on your jacket, bag, lanyard or hat. True fans will notice and admire the amazing pins you have. 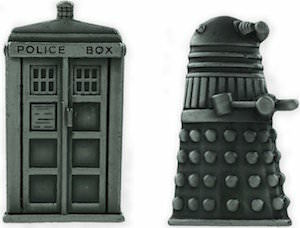 So don’t hesitate order your own Doctor Who Dalek And Tardis Pin Set With Pewter Finish. This Doctor Who button will explain people that TARDIS stand for. The 1″ round button is has a black and white image of the Tardis in the middle with a blue ring around it on witch it says “TARDIS” on top and the explanation “Time and Relative Dimension In Space” on the lower half of the button. Of course many people do not even know what a Tardis is but that makes this a button that you should wear to find more Doctor Who fans and there are so many of them. Jacket, backpack or anything else that can hold a button should get this Doctor Who Tardis Button. Allons-y! that is what the 10th Doctor would say when they would do something. And this catch fraise was fun and to remind you about how much fun the 10th Doctor was there now is a fun button. This black Doctor Who button is 1.5″ in diameter and is a pin back button. And on all that black it says in big white letters “ALLONS-Y!”. Just imagine how much fun it is to have this Doctor Who button on your shirt, jacket or maybe you bag. This Allons-y button is one of those items a Whovian will love and use everyday. So don’t wait come and get your Doctor Who Allons-y! Button. Looking for a fun Doctor Who button that does not scream Tardis or Dalek? This round button is fun but more mysteries. The button shows the Union Jack flag and over it the words “Time Lord” and a true Whovian of course knows that this is a Doctor Who button. The Time Lord button has a 1 inch diameter and has a metal pin back. And surely the picture has a UV protection so that it will look stunning for a long time. Just imagine this Doctor Who button on your jacket, bag, shirt or backpack. Now you can show the Whovian’s that you are one of them with this Doctor Who Union Jack Time Lord Button. If you are a true friend of Doctor Who then of course you need to warn the planet about the Dalek’s and what better way to do that then carry a picture of them with you all the time. This buttons shows a picture of the Dalek and this means that you can easily pin one on almost anything that is made from fabric. You backpack, t-shirt, jacket, pants or hat all can use a Doctor Who Dalek Button. This button is 2.25″ in diameter and shows a white background on witch you can see a drawing of a Dalek. The buttons is printed with a fade resistant ink and has a UV protecting layer so that your new Dalek button can last a long time. If you want to help the Doctor rescue the world then come and get your Doctor Who White Dalek Button.